This baby’s gotta be coming soon. My feet are aching from standing all afternoon since Tristan went down for his nap, but somehow I still can’t stop. My windows have been scrubbed of hand and mouth prints. If you know me, you’re quite aware that window cleaning is not a part of my regular repertoire. My cupboards have been purged and wiped out. For some reason, these tasks seem to carry the utmost importance. Somethin’s up. Environmentally, we are on our way to being ready for the new arrival. Both home and hospital birth supplies are ready. The baby’s bag is packed. The tiny amount of gender neutral neutral (and some as-boy-as-you-can-get) clothes have been washed and placed in the dresser. Physically, I think I’m about as ready as I’m going to be. I’ve read more birthing books that I can count and I don’t think I have it in me to practice any more hypno-birthing relaxation exercises. This baby’s coming out one way or another! Then there’s emotional readiness. That’s where I feel I still have a bit farther to go. I don’t know if I’m ready to be the mother of two children! Then again, I worried about how I would fare with the first, and I think I’ve done a pretty good job. The fear of not loving my baby was clearly unfounded as there is no way I could love Tristan any more. Yet my mind still traces it’s way around these fears this time around. What if I don’t love this new baby like I love Tristan? I fear the guilt that once this new being arrives, neither one of my children will get enough attention. Thinking logically, I’m sure these fears are unfounded, yet they are real none-the-less. I’ve heard other mothers talk about how their love just grew; they didn’t have to divide it among their children. I have faith that the same will prove true for me as well! On the eve of Tristan’s first solo day of preschool, his mama was experiencing some major anxiety. Imagining huge crocodile tears and a sweet little boy begging his mama not to go, I was anticipating huge feelings of guilt knowing that I would have to walk away and leave Tristan at school. Gulp. I feared that the teary eyed first day of my nightmares was imminent. I reassured Tristan that he would have lots of fun and I’d be back to get him right after yoga, and we went about getting ready for our day. 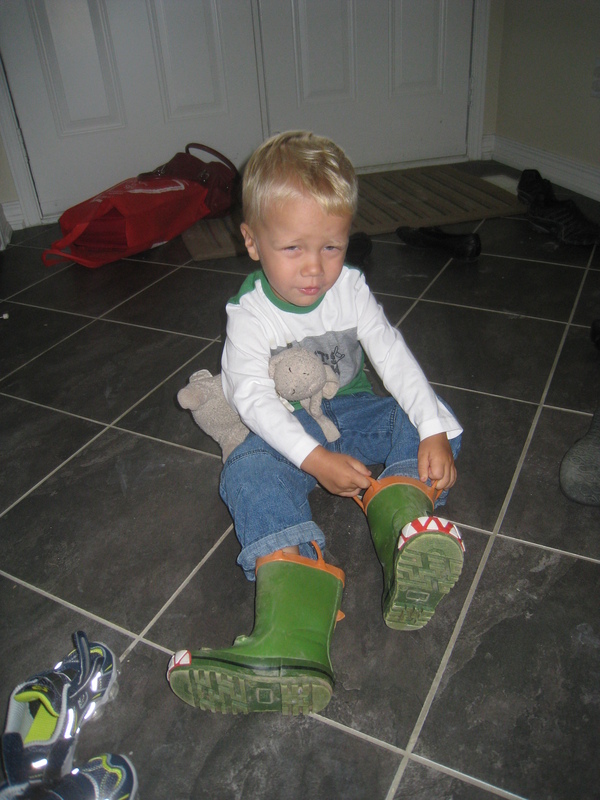 It was a wet, rainy morning so we shelved the brand new school shoes in favour of the green dragon rain boots. Apparently, Tristan decided that this was a good day to begin asserting his independence and insisted on putting his boots on, “all by myself, mommy.” This is not a usual occurrence in Tristan’s little world. He happily chatted on the drive to preschool. My dark sunglasses hid the tears welling up in my eyes. 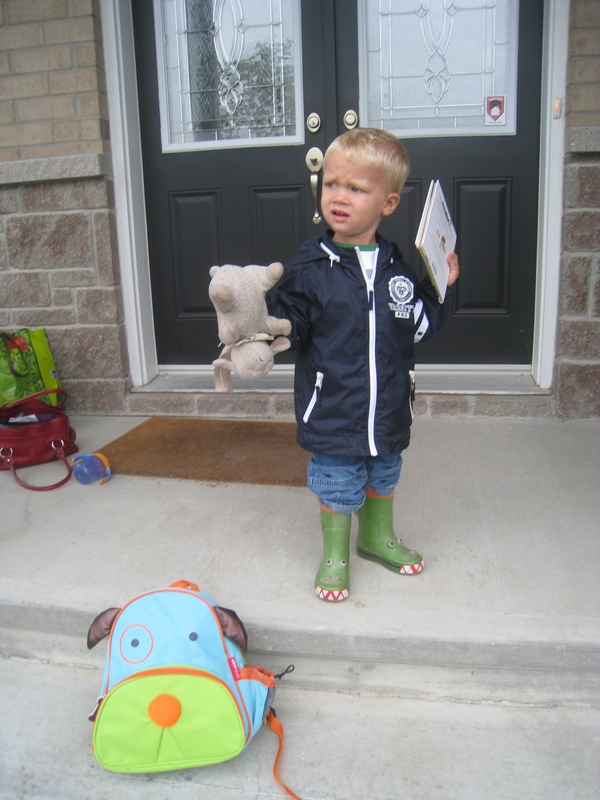 First he didn’t need mommy’s help with his boots and then suddenly we were en route to preschool, just like a big boy. Despite his pleas for, "No pictures Mommy!" a mama's got to have her first day of school picture! We arrived at school and I spent a few minutes in the play kitchen with Tristan, being served up ‘pizza’ and ‘purple juice.’ I got a hug and a kiss from my big boy who turned immediately back to the important business of “making snacks.” I saw the director in the hall on my way out and proudly proclaimed,” He’s not crying! I’m not crying!” Hooray for small victories! I hit Starbucks for a cafe mocha, and got so many errands done, shopping at four stores before it was time to head back to the preschool. I had forgotten how much it was possible to get done when not always walking the pace of a two year old! There were moments that I missed my little sidekick but I have to admit it was nice to have a little time for mommy! I arrived back at the school to find Tristan’s class playing outside. 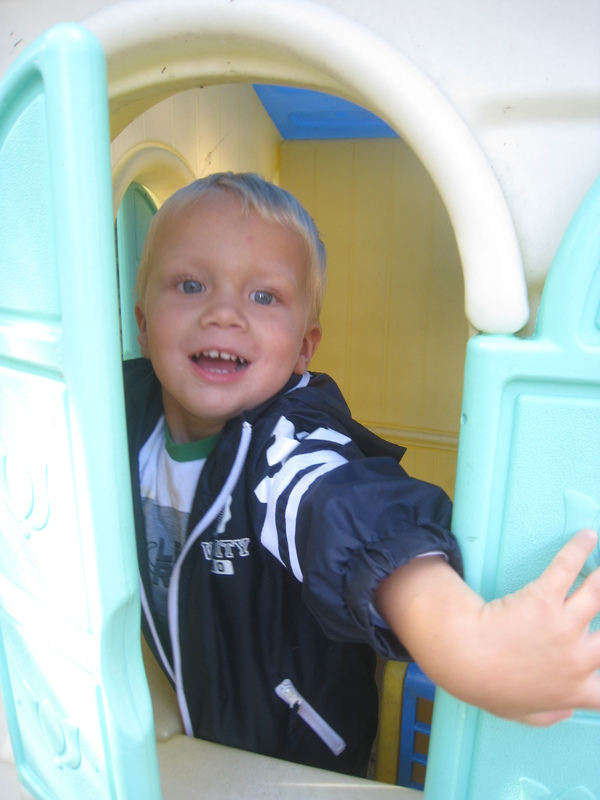 “He’s in the playhouse,” his teacher informed me. Tristan then popped his head out the window and called, “Mommy!” Did he run to me because he missed me so much? Not a chance. His stuck his head back in the playhouse and continued playing with the babies he had in the grocery cart. I eventually had to bribe Tristan to the car with the promise of treats from the grocery store and the assurance that we’d be back at preschool on Wednesday. Apparently I was worried for nothing. Tristan was ready for this big boy adventure! 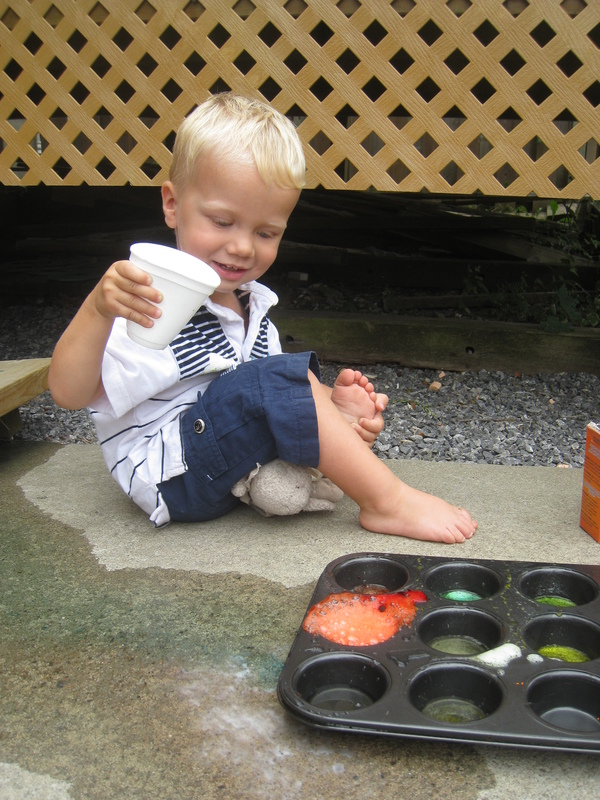 T minus one week until Tristan embarks on his next big boy adventure: My little guy is starting preschool! On Wednesday we go together for an hour, to meet his teachers and hang out in his classroom. The following Monday I will drop Tristan off. At preschool. All by himself!! Ack! I can feel my anxiety mounting by the day. I think Tristan is *sort of* excited to go. We read books daily about going to preschool and all the fun things you get to do there, and we even went shopping for his first backpack. The only catch: he thinks mommy is going to preschool too. This is what worries me. I’ve gently told him in a roundabout way several times that, “yes, mommy will bring you to preschool and will always come to pick you up….” but haven’t got around to making it extremely clear that I am in fact going to drop him off with two strange teachers and a roomful of unknown children and then drive off into the sunset. Ok, so maybe that sounds a little dramatic, but geesh. Tristan and I have been together for 24/7 for the last 2.5 years. It’s going to be such a big adjustment for both of us. I *KNOW* that once he gets into the groove, he is going to absolutely love going to preschool. He is going to love learning, love playing with new kids and impressing his teachers. It’s just the first few days that worry me. I don’t think my heart can take my wee little man crying out for me as I walk away. ACK! Crossing fingers for an uneventful first day! 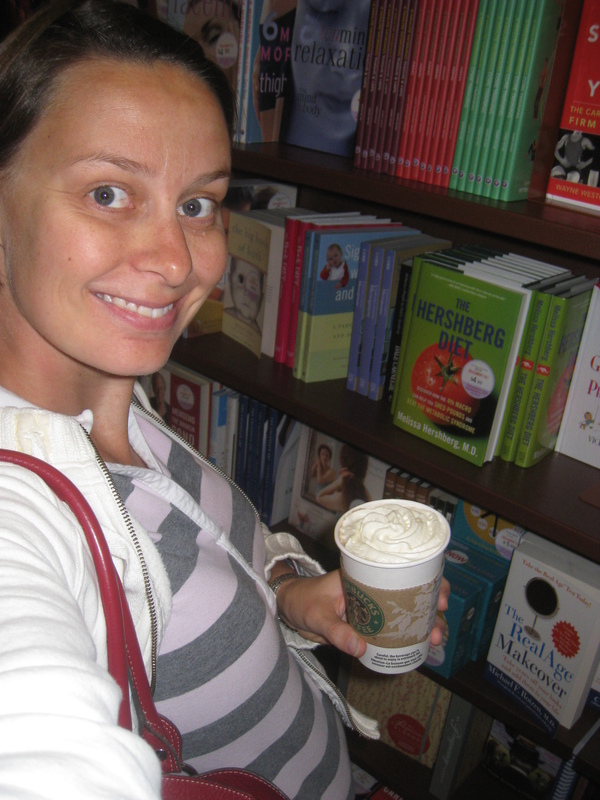 You are currently browsing the A Mom Like Me blog archives for September, 2010.